The painting and decorating in the bathroom at 64 Green Lane North remained unfinished after just a few hours of effort on the afternoon of Saturday 15 April1989. To be honest, such was, and is, my lack of decorating skills that it was with a sense of relief that I went downstairs to take a phone call from the newsroom, presuming to be told of a rota change or a story idea for Monday’s programme. My job in 1989 was producing the Roger Phillips phone-in on BBC Radio Merseyside and I was called into work, along with so many others, because something serious was amiss at Hillsborough where Liverpool were playing and there were reports from our commentator that people were hurt. The significance of the initial reports from the ground must be understood in the context of the times. In 1985, just a few years before, 39 Italian football fans had been crushed at the Heysel Stadium in Brussels were Liverpool had been playing Juventus in the European Cup Final. Liverpool FC, the club that for years had prided itself on having ‘the best behaved supporters in the land’, had had its name dragged through the mud because of violence among supporters at a ground unsafe to stage such a high-profile game. The programme schedules were thrown into the bin and staff and listeners descended on the radio station as they heard the news. A live phone-in with the late presenter Bob Azurdia (who happened to be in the radio station editing at the time) was immediately put on air with me as producer. Then when Roger Phillips came in he took over, as the number of reported dead increased minute by minute. What had started as a football match turned into a major international news story. A turning point was reached not only for the families and their victims and the football authorities but for policing and safety in the UK. Our brief in 1989 and beyond was always to stay in touch with every twist and turn of the story. Our airwaves provided an ever-present platform for listeners’ sadness and anger and, perhaps most importantly, the calling to account of the authorities - not an easy task in a city where one was reminded every day of the hurt and injustice which people felt had been inflicted on them. Our job was to reflect the anger but also to question and ask hard questions of people on all sides. It seems crass and easy to say now but as the story was developing there seemed to be in some media quarters an assumption that Liverpool fans were in some way guilty, or partly guilty, for what had happened. Well no, actually. But when you’re not reporting on a story on a daily or weekly basis it can be a bit too easy to make assumptions and feed your prejudices and pre-conceptions. A recent review in The Tablet of the excellent BBC Two religion commission Hillsborough: Never Forgotten, while praising, saw the programme reviewer John Morrish comment that: “At one point, the story slipped sideways into an account of Liverpool’s sufferings in the 1980s, when it was dubbed ‘the Bermuda Triangle of British capitalism’. 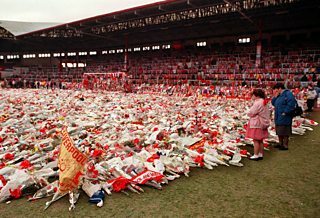 This, it was suggested, led to the bad reputation of Liverpudlians, and to the blaming of the fans for their own deaths. In some ways this ‘Liverpudlian exceptionalism’ came of age in the 1980s. To inhabitants it seemed that the city was never out of the front pages and lead stories on the national news. It seemed we were different - but not in a Beatley, ‘everyone’s-a-comedian’ kind of way. In the early 80s, compared to other English cities, the spotlight seemed to be regularly on Liverpool in all sorts of ways. We’d had Alan Bleasdale’s ground-breaking TV drama Boys from the Blackstuff which inspired, horrified, brought despair or hope; choose all or none of these. Before that there had been the Toxteth riots; then the political battles between the Militant-led Liverpool Labour council and the Thatcher government; then there was the Heysel Stadium tragedy; then Hillsborough. When you look at the long list of Liverpool-related news stories it’s not surprising the city’s inhabitants adopted a siege mentality towards sections of the media, some of which continues today with the famous boycott of the Sun newspaper. But it wasn’t just the Sun. I recall the late and much-respected editor of the Daily Mirror, Richard Stott, coming on our airwaves to defend his paper’s front-page coverage of the tragedy when the crushed faces of fans against the railings were featured in graphic horror. The Radio Merseyside phone-in was extended to two and-a-half hours every lunchtime and for three solid weeks, and at weekends, the only calls we received were about Hillsborough. As the crowds gather at today’s annual memorial service, 24 years after the disaster, the mood may be more hopeful than in previous years, given the Hillsborough Panel’s ground-breaking report last September. But for many of the Hillsborough families there is still unfinished business to attend to as the focus has now shifted towards individuals in authority who they believe still have questions to answer. If you want to call that ‘LIverpudlian exceptionalism’ then so be it. They would probably prefer to call it the ‘struggle for justice’.